Focus tube entering the light path? Got image shift with your SCT? Focuser sluggish in the cold? Difficulties switching from visual, to camera, to binoviewer? Do you run out of travel with your "low profile" focuser? Stuck with a focuser you can't switch between telescope types? Need more precision for your fast optics & CCD Camera? Slipping out of focus with heavy a load? We have a solution for you!!!!!!!!!! The SOLUTION is the no compromise Clement Telescope Focuser. This is not a helical, crayford, or rack and pinion focuser. The patented Clement Focuser is a totally new type of precision positioning device employing non-stiction flexural bearings for precise, repeatable, ultra smooth movement on an atomic level. * Focus position is determined by the use of a single zero backlash non-rotating micrometer leadscrew. *See Alexander H Slocum, "Precision Machine Design"; 8.6, p.521 Flexural Bearings. Special order custom sizes of [aperture and travel]. See Critical Focus REVIEW by Dave Erickson, an optics professional and Senior Scientist with the world leader in interferometric test equipment including fantastic pictures taken with his F/4 Astrograph, STL-11000M Camera, and the new Bellerophon Model Clement Focuser. 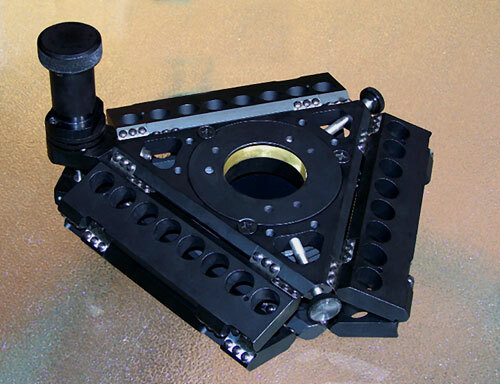 In addition, see AMAZING PICTURES taken by Dave Erickson with his 8.2" F/2.6 Astrograph using a custom made Clement Bellerophon Focuser driving the primary mirror. Easily add: Remote Focus - Autofocus - Temperature Compensation to Clement Focusers with Robo Focus. It can be added at time of purchase or in the future. You can purchase a Robo Focus mounting bracket from us and add your Robo Focus. Or, you can purchase Robo Focus from us and we will install it for no charge. If you currently own Robo Focus you will need a sprocket and timing belt to fit our focuser. Click here for INSTRUCTIONS for installing Robo-Focus Motor on Clement Focuser.